I consider everything rated 7 and above to be good, and a lot of my 6s have good qualities to them; 5 to be just okay/average; and below a 4 to be bad. I try to consider what the show accomplished, how it fit its genres, my personal enjoyment etc. Everything's just my personal opinion. Always open to recommendations! I accept friend requests; I don't bite. Always open for discussion about a good series! Stuff I mark as favorite just means I really, really, like it a lot, regardless of how critically good I think it is. Outside of anime, I enjoy reading, watching figure skating and gymnastics, and sleeping. Hey how are you? I just stumbled up on your account again and I recognized it, because back then I got the Sakura picture from your manga list from you. How are you doing? I am looking forward to the second movie so much, it's almost here! Indeed they do, cuz they know who is the superior girl XD. Have you seen the Heaven's Feel movie yet? Although finishing the next movie with the beheading of Shinji would be a really pleasant and hella wonderful climax and I'm sure it would make the audience lose their heads (no pun intended) , if I were them I would finish the movie at the moment when Shirou wakes up in the church and decides to accept the "totally good" intentions of Kotomine to help him. Or at least I would end it when Shirou faints and Dark Sakura takes Illya away. Anyway, we can only wait and see (I just hope I don't die before lol). I can't blame them for caring mostly about America, it's the damn summit of capitalism. But, there are more countries in the map. Like Spain, for example, ahem. You're welcome, and I thank you for having accepted it. Yes, the truth is that Sakura is a character that I like a lot. I mean, who on the face of the Earth doesn't like Sakura? We all have our tastes but I read certain things that they write about the character that I don't like them to say. I'm sure it happened to you too. I can understand that a character does not appeal to one person as much as another because he simply does not identify with you or does not fit your tastes. But when you read things like "she deserved everything that happened to her" or any kind of hate message, it's just hard for me to understand. 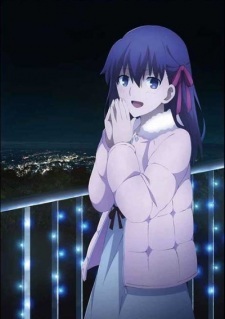 Maybe it's hard for me to understand because Sakura is a character to whom I have a lot of respect since I first played the visual novel (it was the first time I cried for a character because I was hearing from her own mouth what she had lived for eleven years in that great Heaven's Feel scene where Shirou and she are in the rain). There are those who speak of Sakura as if she is weak, as if she is a burden or an annoyance to the story (or to Shirou). I honestly think of Sakura as a psychologically very strong character. I guess that not being a badass girl like Saber or Rin the character is not liked by many, I don't know. If you remove to Heaven's Feel the magic, the Servants, the Masters and "the shadow" is a story about domestic abuse, depression, inferority complex, suicidal thoughts and sexual abuse but also a story of overcoming. Of course, the scars and the pain will always be there, but at the end of the story, a new future blossoms and Sakura manages to smile for herself. I don't think that a character with such a story should be denigrated or considered inferior. Lol, forgive me for having extended me so much. When a character or a thing wakes up in my intense emotions I start writing like crazy and sometimes I forget that there is someone who has to read it. I'm sorry. It brings warmth to my heart seeing a fellow fan of the most fucked up and underrated heroine in FSN. Cause everyone else seem to hate her here on MAL. Oh yes, Tomoya is one of my favorite male protagonists, like ever. He's just so relatable and easy to like. Out of the three protagonist males from Air, Kanon, and Clannad, Tomoya was the one I found to really have a connection as a character to. Yeah for sure, I feel the same way as you do for Nagisa. Her character just got developed more which made me change my perception of her overall. I haven't watched any of the Kyou x Tomoya / Tomoyo x Tomoya side episodes in the alt universe yet. But I'm a bit hesitant to watch them, as I just can't see Tomoya with anyone else but Nagisa, it'll probably be weird for me to see him with anyone else xD I noticed that you watched them, what's your take on the 2 episodes? Yeah I agree with you, I am so glad that the people behind Kara no Kyoukai and Zero are behind Heaven's Feel! The music and the general atmosphere of the movie adds so much. Sakura has also been my favorite for a while (I started with UBW so I liked Rin first obviously) then I watched Zero and I really wanted to find out more about her and HF in general so I read the visual novel and since then I like Sakura the most. I am also really looking forward to the next movies, hopefully I will be able to watch them in a theater again, because the visuals and the sound design definitely deserve to be watched in a cinema.